Did you check out the Weekly Spotlight last week? Check out the 5 Indian Start-ups you should know about, that we covered previously. Swiggy started operations in August 2014 in the Koramangala neighbourhood of Bangalore and has been growing at a very fast pace since. Using a fleet of delivery personnel equipped with smartphones and an apppowered by routing algorithms, Swiggy is creating an efficient logistics solution for food deliveries. 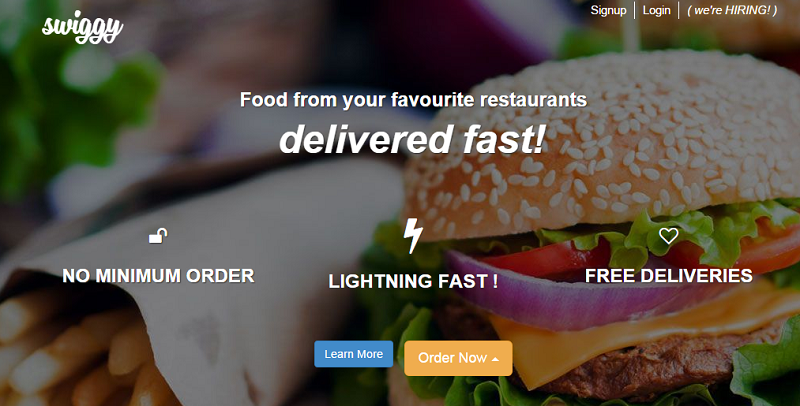 This ensures that Swiggy provides customers with timely deliveries and real-time tracking of their order status. Additionally, curated menus, visual guides and a careful selection of popular restaurants ensures a novel food discovery experience for customers. Online food delivery has been growing exponentially over the past few years, and Swiggy is betting on their timely deliveriesand superior service levels to dominate the market. SAIF Partners and Accel Partners have invested $2 Million in Swiggy, recently. When you need to invest money, how do you go about it? You will either Google for information, ask your friends or parents or refer to personal finance magazines. Very seldom do folks approach a Personal Finance Advisor or Financial Planner. Finqa was started to change this norm. At Finqa, the team creates a plan which is tailored to an individual’s needs instead of generic advice. After a client has fully understood the plan and knows exactly where their money is being invested, Finqa initiate investments directly into various products. Delhi based RPW is one of its kind portal in India which guides to buy pre-rented properties so that the client achieves financial independence by recognizing the right revenue generated assets. The start-up has a 4 members advisory team which guides the client from scartch to own their valuable property without any hassle. At presently RPW is focusing on two main realty services viz, Pre-Rented / Pre-Leased Property and Assured Return Properties to the Individual Buyers, HNI’s, Corporate Buyers, NRI’s. Currently the website has more than 100 verified listing worth of Rs. 1000 Crore + property value deals listed for the specific sets of buyers. In the first three months of operations the start-up has generated 450 Crore buyers enquires and looking forward to generate Rs. 5000 crore buyers enquiry by the end of its first year. The idea behind TheSecretKart.com is to help people find sexual wellness products at best prices on one platform. This is also good for sellers as they get another sales channel online to showcase their products at competitive prices. It is interesting to note that TheSecretKart.com, which began its operations on 1st Dec, 2014 had more than 42,000 visitors by the new year’s eve. This is a sign that the Indian eCommerce market desperately needs such a platform. “It is no longer a taboo to purchase these products in India. In fact, people have been buying all these products for years from their nearby medical/ retail stores. My platform is a big step ahead in that direction and it makes it convenient for people to buy these products at the click of a button.”, says Nitin Kashyap, the Bangalore based entrepreneur behind the website. He adds that TheSecretKart.com was shortlisted in start-up competitions by both “Microsoft Ventures” and “Wharton India Economic Forum [WIEF] 2015”. What makes us happy? A furry ball of cuteness with wet nose, wagging their tail, waiting at the doorstep or peeping through the window so that they can lick the hell out of us. That’s their way of showing love. Now its time that we make them feel special and loved , and what better way than presenting them a box full of goodies every month. BarkLoot is a monthly box delivered right to your doorstep containing variety of products just for your dogs – anything from toys, treats, bones, chew sticks, accessories to grooming products. With BarkLoot monthly subscriptions which starts at as low as Rs. 999/month, pups get to enjoy different products every month and also the pet parents can save big on time and money by letting the start-up curate and deliver the products. 6 CEOs share things that Entrepreneurs should know before launching their start-up. The Purple Turtles – A Bangalore start-up that has a client list of Google, Facebook, Microsoft, Amazon and more. Previous articleTop 3 summer internships from Amazon, ONGC and Intel. Next articleXIMB completes placements for Batch 2013-15; Highest Salary Offer touches 20.50 Lakhs.